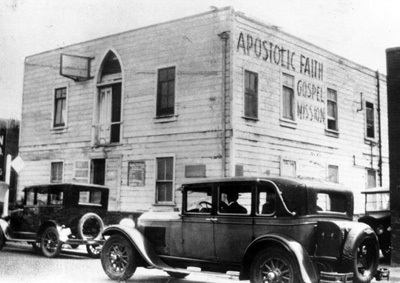 The Azusa Street Revival, beginning in the spring of 1906, largely spawned the worldwide Pentecostal movement. It commenced in a former African Methodist Episcopal church building located at 312 Azusa Street in Los Angeles, California. The primary leader was evangelist William J. Seymour, who came to Los Angeles to preach the apostolic faith, a teaching that combined the baptism of the Holy Spirit with speaking in tongues (glossalalia), such as was experienced in Jerusalem on the Day of Pentecost, as recorded in Acts 2. From the beginning, Seymour’s Apostolic Faith Mission attracted attention because of the unusual features of its worship services. As one newspaper reporter commented, “Colored people and a sprinkling of whites compose the congregation, and night is made hideous in the neighborhood by the howlings of the worshippers who spend hours swaying forth and back in a nerve-racking attitude of prayer and supplication.” Yet Seymour and his initial small group of worshippers persisted, and more people were attracted to the services. To inform people around the world about events at Azusa Street, Seymour and Clara E. Lum, a white woman, co-edited a paper, Apostolic Faith. It was distributed without charge to thousands of ministers and lay people. Gary McGee, Assembly of God historian, states that 5,000 copies of the first edition (September 1906) were printed, and by 1907 the press run reached 40,000. Within two years of the paper’s initial printing, Seymour and Lum entered into a long conflict over the paper and its mailing lists. Because of the conflict, his disavowal of the initial evidence teaching, and racial conflicts within Pentecostalism, Seymour largely fell into obscurity by 1912.